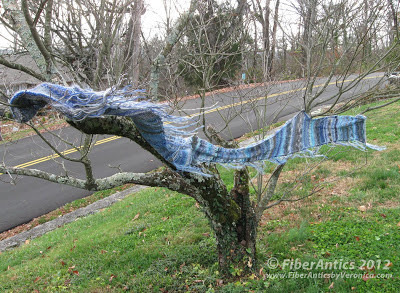 The Sky Scarf flies through the trees on this cold, windy December day. The Sky Scarf climbs the trees, swings on the branches and scales walls. "Rapunzel, Rapunzel, wherefore art thou?" The Sky Scarf swings on branches and climbs walls. The Sky Scarf converses with the lavender. It brings a lightness to the otherwise brown and gray wintered garden. 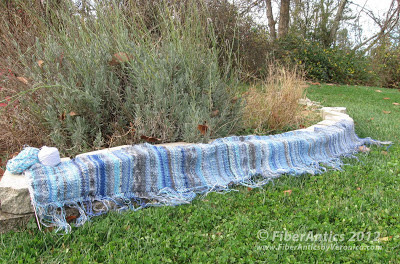 The Sky Scarf sits beside the lavender in the garden. 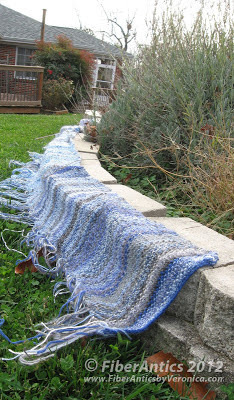 Alas, it's time for the Sky Scarf and I to return to the warmth of the inside. 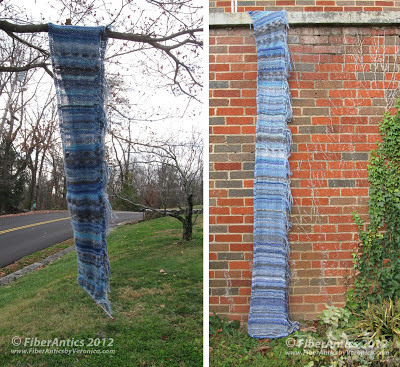 The Sky Scarf on 12-12-12. I couldn't pass up this numerical date rarity—when all three numbers in the date are the same—without documenting it... since it won't come back around for another 88 years, on 1-1-2101. With only 19 more days left on my 2012 Sky Scarf project, I thought it appropriate to document the date with my scarf. So here we are, on a cold and windy December 12, 2012 in Chattanooga.